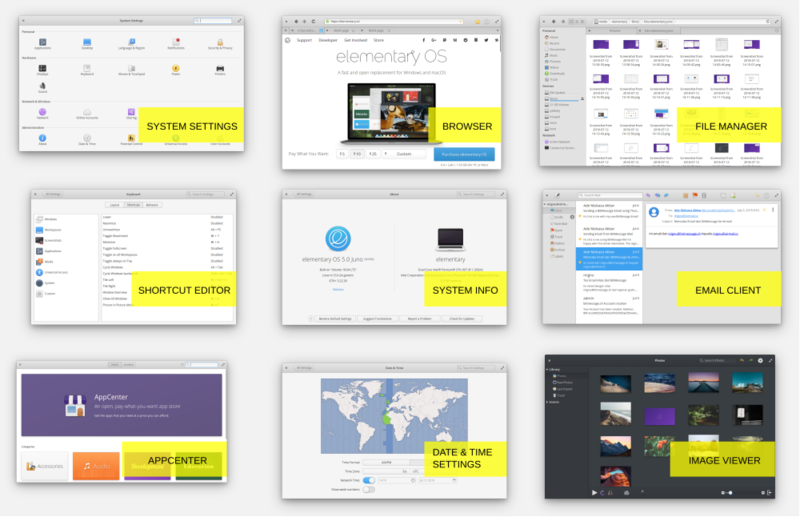 Here's a second short preview (after the March 2018 one) to the next 5.0 version of elementary OS from the development release. We're getting closer to final now as the Beta 1 has been released and the Beta 2 has been started but it's still not recommended to install or use the Betas. This means do not upgrade to Beta 1 or Beta 2 yet, nor install the Beta, but wait until the final version officially released. To sum it up, in 5.0, the user interface is getting more cool with tons of improvement; and the AppCenter is really amazing with payment system for both developers who deserve funds and users who want to contribute. I also mention how active the development progress is below and how we can help. This preview is very brief and cannot represent the final as the final could have more and more amazing additions. Anyway, wait for the final and enjoy reading! Do Not Use Beta 1! 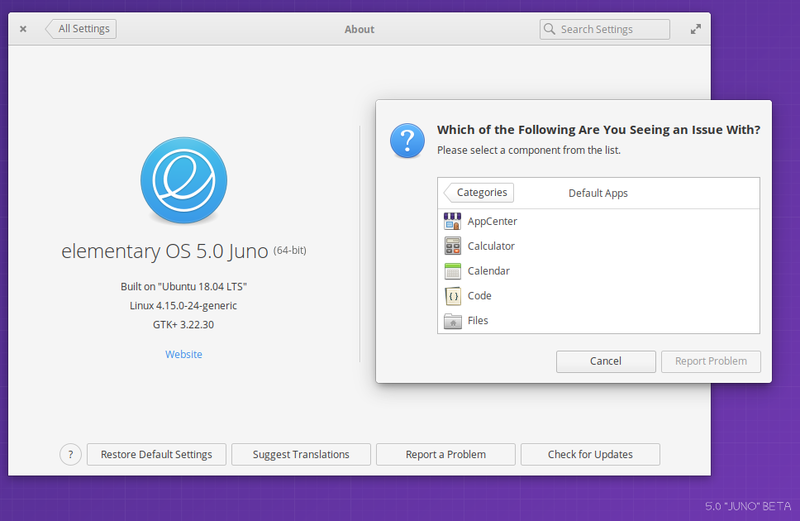 The elementary OS blog clearly stated that Beta 1 is not stable, not for daily use, not for end user, not to install, and the developer even asking reviewers not to review this version. If you have the download link, don't download it. So for anyone (except you're a power user or developer) do not use or upgrade to Beta 1! Wait for the final version instead once it released. 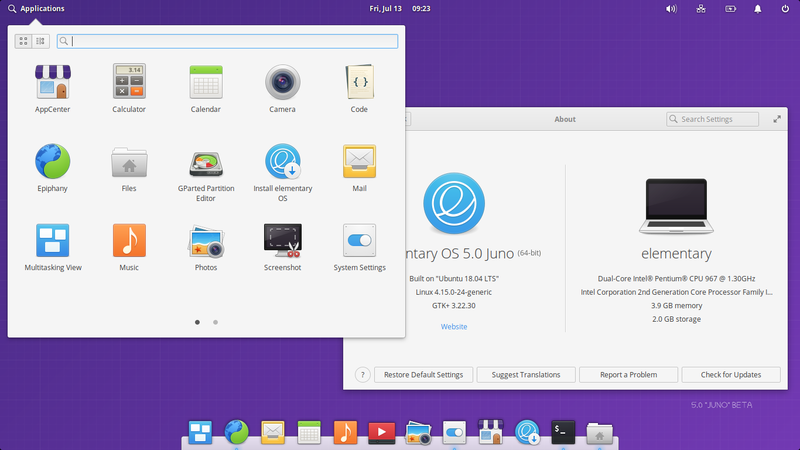 The elementary OS developer has stated that the team does not want to disclose the release date. So we still don't know precisely when it will be released. This is a summary of Beta 1 system. Please note again that any technical detail can be changed in final release. 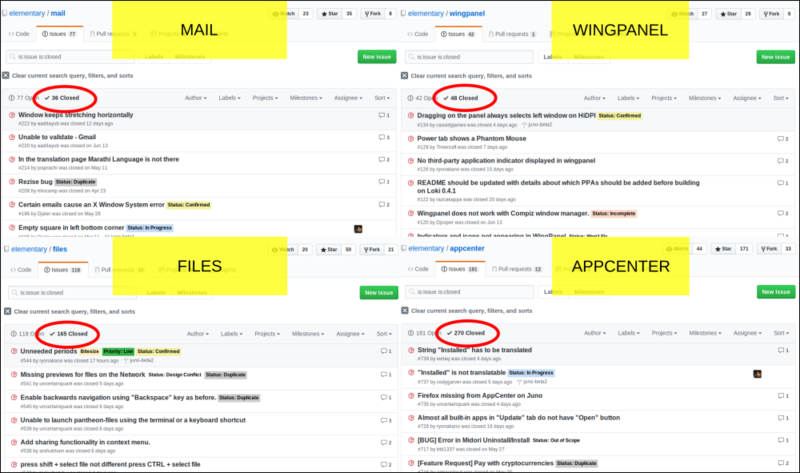 For users, we can see that the development is very active by visiting the development page (in GitHub) where there are public repositories of individual elementary OS' programs like Mail, Wingpanel, Files, and AppCenter. For example, simply go to GitHub elementary OS > pick appcenter > then go to Issue section > and choose Closed > this is how to see AppCenter development activities. You may see issues reported by another elementary users and how the developer solves them. See picture below, we may know how many improvements made by looking at the Closed number (means "stuffs already fixed") and the dates of latest improvements there. This way we can appreciate the developers more and this can encourage us to spread the development info. For developers, you can help the development by joining the programming stuffs at this GitHub. 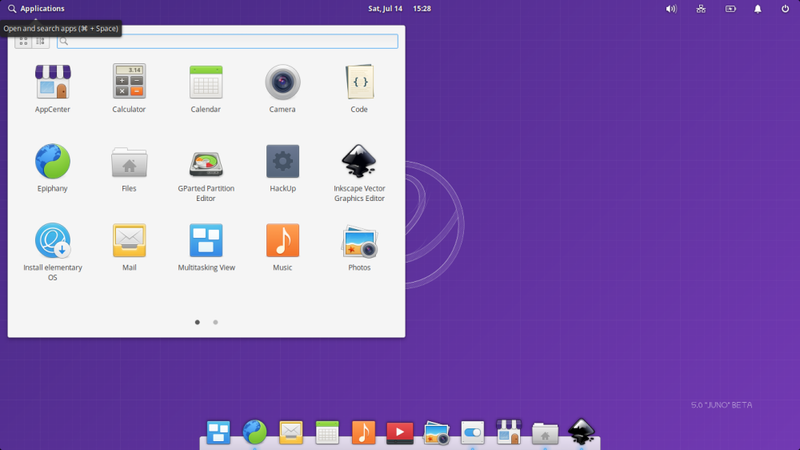 Here's how elementary OS 5.0 looks like from its development version (Beta 1) with the blue Beta Version wallpaper. The desktop has already very improved compared to the old versions 0.1 Jupiter, 0.2 Luna, 0.3 Freya, but closest to latest stable version 0.4 Loki. See the menu, the magnifier glass icon, and the tooltip? 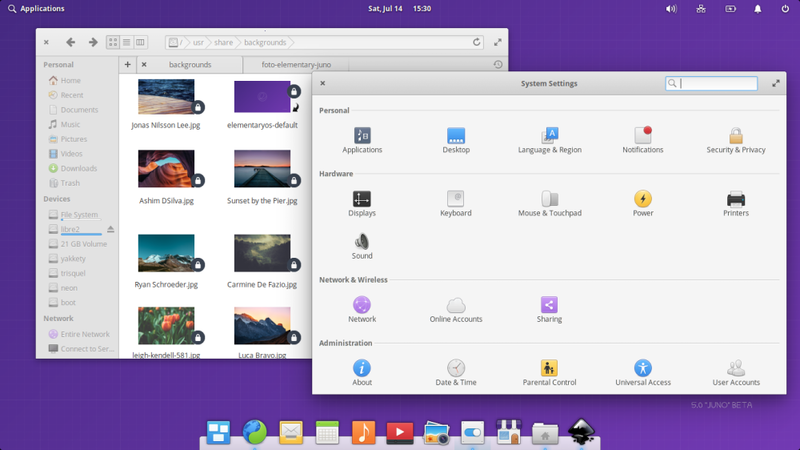 For new comers, here's how the applications of newest elementary OS look like. It's sleek, shiny, and standardized in their design thanks to the HIG. 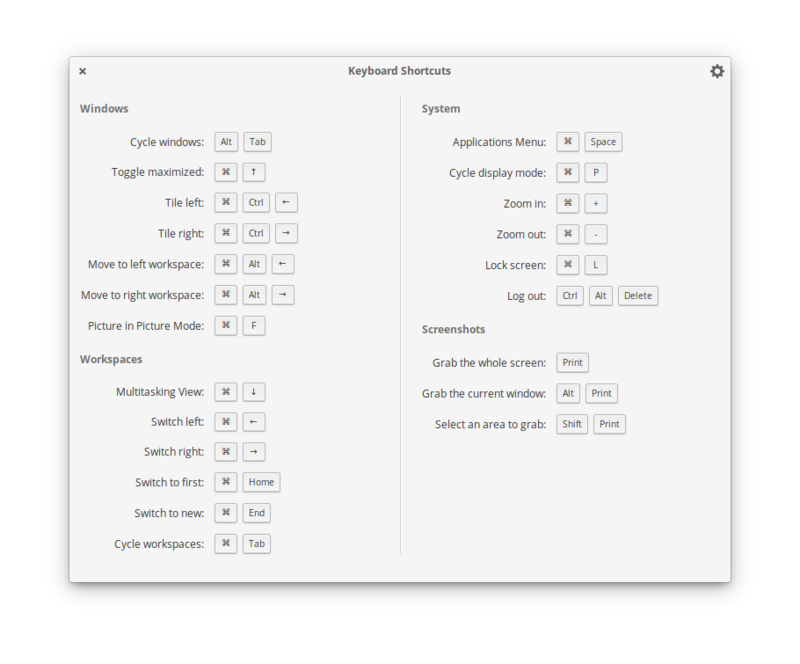 The 5.0 has been developed to take advantage of latest GTK+3, see the header bar for example: making each window interface simpler, easy to understand, and enlarges the working area for us! For both developers and users, here are two groups of app in AppCenter, ones with payment option, and ones without. The payment from the user side is done via Stripe. 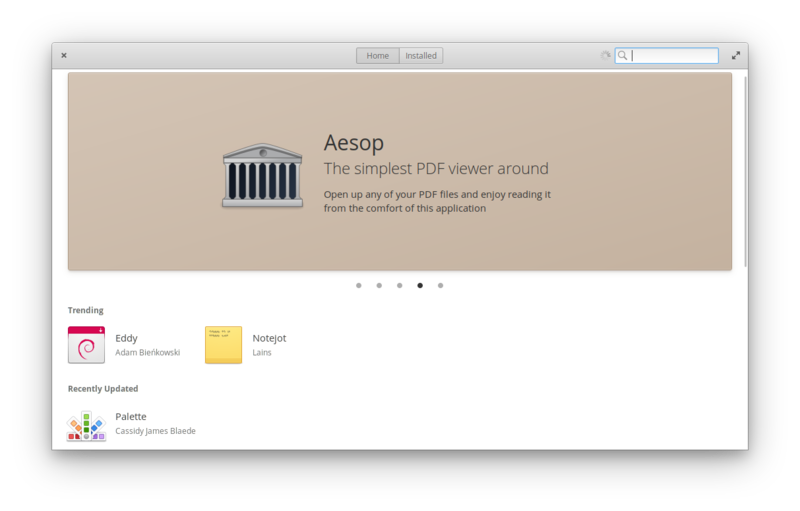 Important to mention, this AppCenter has a slogan "An Open, Pay What You Want App Store". So, the number can be turned zero (gratis) while we can still pay later as we wish. The main concept behind AppCenter is to balance between both free software/open source development deserves money to support it and user deserves a way to pay their favorite developer as they wish, at any time, without forgetting which app they wish to pay. I think it's fair. What I personally believe is this platform will be big as it allows this wise system works, user can pay at any time what they want at any price they wish. 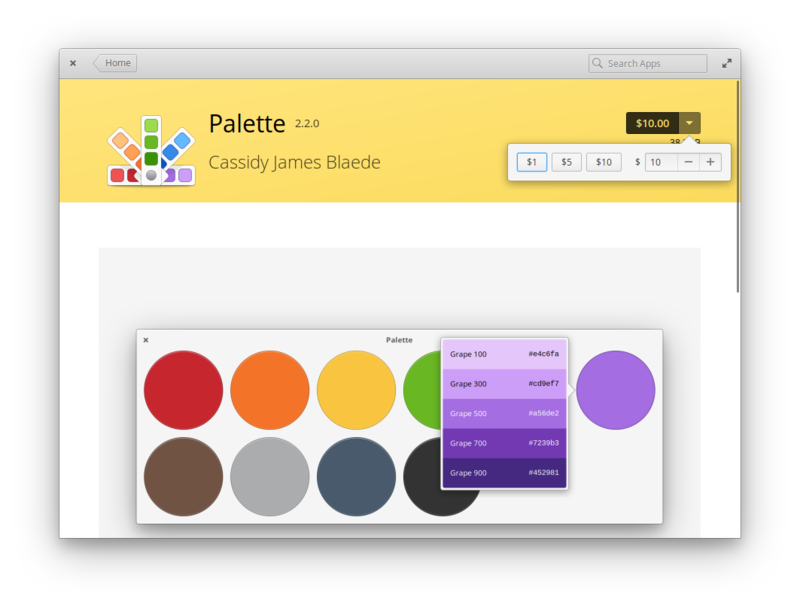 See below, for elementary OS apps (not repository apps), for example Palette by Cassidy James, we may find the price tag with amount we may choose or determine. The price tag is placed on top an bottom. Just like what elementary OS team, and also I personally believe, for many people, an easy funding to certain/favorite FLOSS developer is a long awaited facility. And this feature in AppCenter will make it real as user can donate with this payment method at any time, whether it's before or after installing the program. For the basic functionality of showing repository apps, of course, you can search within many software packages available or simply browse the categories. 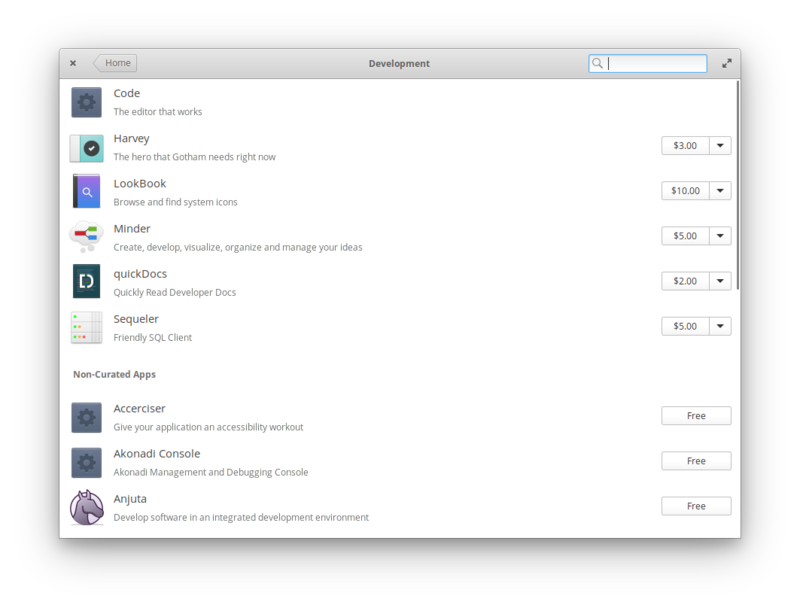 AppCenter divides two sections clearly: the section of "Non-Curated Apps" is for normal repository applications, while the section above it is for elementary OS applications. elementary is an user friendly OS. In the 5.0, even the bug report tool is user friendly. Find it out on System Settings > About > Report Bug > selection of programs showing in fancy way > select a program to be reported > press Report Problem > a Bug Report page (GitHub) corresponding to program you selected showing in your Browser. I've not been found any other desktop bug report system as easy as this. 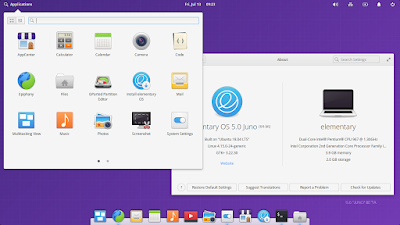 For all kind of user, development of elementary OS can be helped and accelerated by funding. You can help elementary OS via Patreon, PayPal, BountySource, or even their Merchandise Store. For programmers and developers in general, you can help with your skill in elementary GitHub. We're Waiting for Final Version! Thanks to Daniel Fore, thanks to Cassidy James, thanks to all elementary OS contributors. For all user, we need to be patient, wait the final release if you want to upgrade or to install elementary OS 5.0 Juno. Do not upgrade to Beta 1, or Beta 2, just the Final. Personally, it's difficult to myself to wait until I can review the final version because since my March first preview, it's already amusing. I am sure the final will be very great!